Hello Members and Friends of the Polish Business Club in Jakarta. We are ready to invite you to our pre-Christmas Gathering. Before I give you details of our next event, I would like to thank all of you, who joined us on the 8th of November. The Eastern Promise Bar & Resto gave us one more excellent night by serving very delicious Indian Food and preparing audio-video equipment for our presentation. 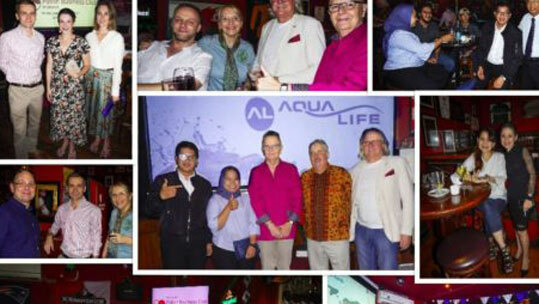 I was the one who promoted the Aqua – Life desalination technology as my boss Mr. Woytek Halicki, the Marketing Director of the company www.aqua-life.com, who was with us that evening, was still experiencing jet-lag. We also had as guests that night representatives of PT. Global Tekno Indonesia, https://global-tekno.com , the sole agent of this technology in Indonesia. If you have any questions related to this presentation, please contact me directly. Having the opportunity to relate to you highlights of that evening, I would like to thank our donors that night – Marek Białogłowy, our vice-chairman, for supporting us with a keg of Heineken beer and Dagfinn Kvemmen, who has already left Indonesia after many years to return to his homeland Norway, for donating a few bottles of Nordic vodka. Thank you once again, Gentlemen.